Good Morning / I Was Born, But... (which I read recently was the silent movie that revolutionised Japanese cinema). Unfortunately Hal, Japanese film studios were not known for taking care of their master prints. And Ozu's fame outside of Japan really didn't take place until the mid-60's, about five years after his death. You should check out Leo McCarey's 1937 film Make Way for Tomorrow, which deals with the same storyline, it's considered McCarey's best film. Then I would definitely recommend my favorite Ozu film, Banshun (Late Spring) (1949), she just radiates in that film and the story is a little more accessible than Tokyo Story. Thanks. I've added both to my wishlist! The last sentence sums it up. She was one of a kind! Well, that's a nice surprise! My Ozu films arrived today and while I know BFI releases are usually fantastic, I thought the double set of Good Morning / I Was Born, But... was a one off because it's the only one with such a title. But actually, they all include a second film. I thought I was buying four discs with five films, but actually I have eight! Each release is dual format, with the main film on Blu and DVD, plus the extra film on the DVD too. Good thick booklets with each as well. These are like Criterion releases! Start with Late Spring, it's the best of the bunch. The USS Reluctant carries cargo along World War II's forgotten Pacific seaways. Beyond the horizon, the real war passes its stir-crazy crew by. Mister Roberts, directed by John Ford and Mervyn LeRoy, is the classic story of men fighting to survive not war's dangers but its indignities. Henry Fonda's reprise of his Tony-winning Broadway role returned him to movies after seven years away. Jack Lemmon won his first Academy Award™* as hapless, lecherous Ensign Pulver. James Cagney's petty, scrappy Captain makes a fierce adversary. In his final film, William Powell makes world-weary Doc a sage for the ages. Mister Roberts has moments of unforgettable humor. But sadness tempers the comedy. No shot is fired. No blood is spilled. 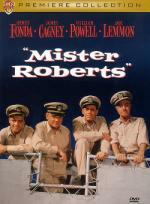 Yet Mister Roberts endures as one of our most truthful war sagas. This is one of my favorite movies from this era with an outstanding cast which blends some aging stars (Powell and Cagney) with an up-and-coming Jack Lemmon (he looks much younger than his actual 30 years here) and an always solid Henry Fonda. Nominated for Best Picture, this film blends some great comedic moments with some touching drama taking you from outbursts of laughter to the edge of tears. What more can you ask of great movie? Not to mention the clear and present moral....the grass is not always greener. Although he would live another 30 years, this is William Powell's final film. Thanks for the review, Hal. 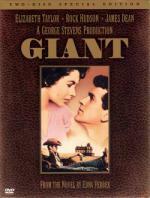 Giant is a movie of huge scale and grandeur in which three generations of land-rich Texans love, swagger, connive and clash in a saga of family strife, racial bigotry and conflict between cattle barons and newly rich oil tycoons. It's also one of the most beloved works of director George Stevens, who won an Academy Award® for this film, one of the 10 Oscar® nominations the film earned. I had actually never seen this movie before, mainly because I had picked up the impression somewhere along the way that it was a long, single episode soap opera. It turns out, that's exactly what it is. I have a feeling that this film benefits from the "James Dean" effect, as it is the last film he starred in before his tragic death in a car accident in 1955. Somehow, Hollywood actors who die young seem to acquire a certain mystical aura which seems to work retroactively, and perhaps sometimes affording a film a greater stature than it would have otherwise enjoyed had the tragedy not occurred. Hudson, Taylor and Dean were excellent in their roles, but I have to believe that Texans of the day were not overjoyed with this movie as it is not a very flattering portrayal of its residents, showing them as steeped in tradition and clearly full of prejudice not just of Mexicans, but of women as well. The stark contrast between rich and poor and educated and ignorant was strikingly painted. Given that this was released in 1956, some of these themes were pretty daring, even if they seem tame today. Rock Hudson's reversal in the end did not strike me as particularly realistic, since in my experience, people who harbor these type of prejudices rarely change. If I have any complaint it is that it was too long with several scenes that could easily have been shortened or eliminated without losing anything from the story. Secondly, even as an American, and one who has lived in the South for 35 years, I had a hard time with the dialog at several points, especially Mercedes McCambridge and James Dean. Once again, Hollywood was trying a little too hard for that "authentic" Texas drawl, I guess! Although nominated for 10 Academy Awards, including Best Picture, it only took home the Oscar for George Stevens as Director; well deserved in my opinion. I think that's very true with Giant. It boasted big stars: Rock Hudson, Elizabeth Taylor (nearly 2 years since her last film), and the late James Dean, over a year since his death! I think that added a lot of hype for the film as people wanted to see him one more time. George Stevens was fresh off his Oscar win for Shane. I love a slow sprawling epic, so I've always enjoyed Giant, but I understand that it could have been much less "epic" and still told its story. A powerful film about a ruthless journalist and an unscrupulous press agent who'll do anything to achieve success, this "fascinating, compelling story" (The Hollywood Reporter) crackles with "taut direction and whiplash dialogue" (Time Magazine). Bristling with "vivid performances" by Curtis and Lancaster, this gutsy exposé of big-city corruption is a timeless classic that cuts deep and sends a chilling message. It's late at night in the steamy, neon-lit streets of New York's Times Square, and everything's buzzing with nervous energy. But press agent Sidney Falco (Tony Curtis) is oblivious to the whirlwind of street vendors, call girls and con men bustling around him as he nervously waits for the early edition of The Globe. Whose career did gossip columnist J.J. Hunsecker (Burt Lancaster) launch today...and whose did he destroy? I felt like I needed to take a shower after watching this film. The only likable character in the whole movie is Steve Dallas (Milner), the jazz player. J.J. Hunsecker (Lancaster) is a gossip columnist who uses his profession as a weapon to build his own power base while destroying some lives and promoting others. Sidney Falco (Curtis) is a press agent aspiring to be the next J.J. and stooping to any level if it advances that goal, including being lapdog to J.J. The cops are dirty, other columnists will print lies for a night with a prostitute. Susan Hunsecker is a whimpering baby living with and off her older brother. There is clearly an abnormal relationship between the two of them, at least as far as J.J. goes. Done in the classic film noir tradition, this movie is among the best in that genre. The cinematography reflects the darkness of the theme of the film, while the jazz music provides a great contrast. The cast did a superb job, with a really well written and believable script. Susan Harrison was the only weak link, which probably explains why she has only been in one other film, that I know of. If you want to see the seamy side of the newspaper columnist business, this is a must see.